Greetings to all readers in the precious name of the Lord and Savior Jesus Christ. 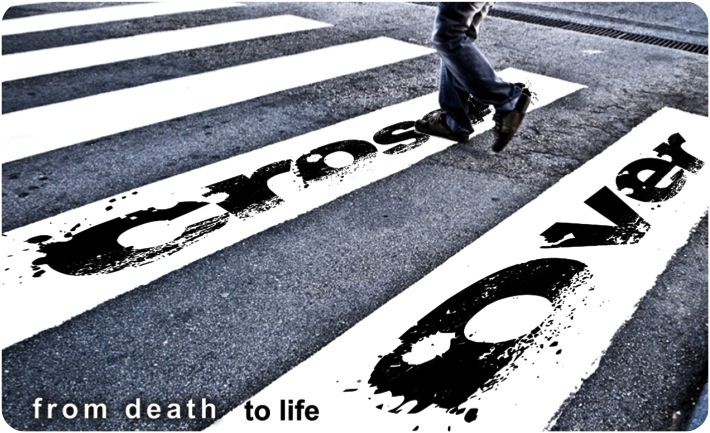 20 June 2010, God spoke to me at 4 am; he bestowed me with this subject “Crossed Over”. Let the grace and power of our Lord Jesus Christ be showered unto you all by this article of The Living Rhema. In a Christian life, there is always a barrier which we need to cross over with the help of the Holy Spirit. Now you may ask, is it necessary to cross over these barriers? Yes! It is quite essential for us to cross over these trials because our destiny is on the other side of the barrier… God has prepared the best plan for our life on the other side. Some mighty men, marked in the holy bible, have failed to cross these barriers in spite of their glorious beginning. These barriers are like humps on the road which makes the spiritual alacrity down. No child of god can cross over these barriers by his or her own vigor. The bible clearly states in John 14:16 “And I will pray the Father, and He will give you another Helper, that He may abide with you forever .” Without the anointment of the Holy Spirit, we cannot cross over these obstructions which come across daily in our Christian life. You must admit with me that each and every day we do face a new trial. And crossing these new trails constantly seems to be difficult. Remember! The barriers which you see ahead are not the end of your destiny but the almighty god wants to begin with you. God bestowed me with a phrase few days back and strengthened me by saying “you may think that you have failed but I have not failed on you”. Have you ever noticed a navigator installed in the car which directs us to move forward even though we are not in a pleasant aura ? Holy Spirit is like this navigator in our life which governs us by uttering each day “Keep going” when we declare “I am tired and lost”. Don’t make conclusive decisions about yourself but entrust it in the hands of the author and finisher of our faith- Lord Jesus Christ. He who began a good work in you will be faithful to complete it. Here in this verse, we see Elisha pursuing his master Elijah from the place called Gilgal to Jordan. Elisha was seeking the double anointment. That’s why in spite of his master’s disapproval, he still followed him. We are in an era where men do seek the treasures of the world more than the celestial hoard. However, Elisha was pursuing the double anointment from the lord rather than earthly possessions. He was not after money, renowned position, status but he was after something which would always keep him going – A Double Anointment from the lord.Your Money, Caliber and Character will never help you to cross over these hurdles. Your position in the society will not help you to cross over. All you need is the anointment of the Holy Spirit to cross over these obstructions. The world is at the end of its age and the kingdom of God is at hand. So to overcome every new trail which decelerates our spiritual life, you need to be filled with the Holy Spirit. Elisha waited and pursued the double anointment. The problem with this generation is that we do pursue to receive the Holy Spirit but we don’t wait patiently. Acts 2:1-4, ‘disciples waited for the promise and when that day was fully come, they were filled and the Holy Spirit sat on them.’ You must wait until the Holy Spirit sits on you. You must tarry for the day appointed by god. For instance, when a chicken’s egg is under the wings of its mother for 21 days, it will be no more an immature egg. Instead, it will be a living stock. In the initial stage of Elisha’s ministry, he had to cross over the river Jordan. I would like to encourage those who have a calling for the ministry that they need to cross over the barrier of reproach, shame, dishonor, persecution, trials, and temptations. Some of them feel that when they initially step into the ministry, they will have an attractive and pleasant time but I want to tell you the truth that assuredly they will receive blessings from the lord. But to receive the approbation, they need to cross over some hardships along the walk of life. Joseph saw a wonderful dream, but he had to cross over many hurdles which came along. Jesus said in Luke 9:62 “Anyone who puts a hand to the plow and then looks back is not fit for the Kingdom of God.” I know some servants of god and even some believers who received Jesus Christ as their personal savior, but failed to cross these trials. They turned back and went on their own paths. Nobody knew Jesus Christ in his earlier stage of ministry. But in Luke 4: 1, ‘Then Jesus, being filled with the Holy Spirit, returned from the Jordan and was led by the Spirit into the wilderness ‘ and in verse 14 it is said, ‘Then Jesus returned in the power of the Spirit to Galilee, and news of Him went out through all the surrounding region.’ Jesus ‘crossed over’ this situation. He was filled with the Holy Spirit when he was led into wilderness but we do read in the passage that he returned back with the exhaustive power of Holy Spirit. The Power of Holy Spirit will manifest only when you are filled with the Spirit and when you are completely filled with the Holy Spirit, then only you can crossover. Holy Spirit is a personality and he has the power, but unfortunately some of them only know his power. Many think that Holy Spirit is something which comes at the end of a song; some people think that Holy Spirit is found only inside the church and many think that Holy Spirit is something which ascends only when they worship the Lord. Totally wrong!! Holy Spirit is not who comes only when you gather in a church. He is there even when you are alone. 1 Corinthians 3:16 says, ‘Know ye not that ye are the temple of God, and that the Spirit of God dwelleth in you?’ Here, Paul is addressing the Corinthian Church who knew only the power of the Holy Spirit and had failed to understand his personality. David in psalms 139:7 says, ‘Wither shall I go from thy spirit? Or whither shall I flee from they presence?’ He knew the power and the personality of the Spirit of God. Let me tell you one truth which is powerful “The power of Holy Spirit will be manifested on you only when you know his personality”. If you are person who knows only the power of the Holy Spirit, you cannot cross over the trials. You must acknowledge his personality that he is able to enable you to ‘cross over’. If God has raised Jesus Christ from the death, he is able to raise you from every circumstance you are into. Let the church know the personality and power of the Holy Spirit. Water (Holy Spirit) shall be in him like a well of water springing up. Holy Spirit in you must be like a well of water springing up like a fountain. This shows the fullness. If Elisha with the double anointment crossed over, then how much more will the New Testament Church cross over the trials, whom God has promised to fill with his Spirit as well of water. Spirit of love, joy, peace, goodness,selfcontrol,longsuffering etc. The devil and his minions are aiming their weapons against the church but the church has crossed over every hurdle till now and it will cross over in the coming days . Who is helping the church to cross over?? Not by might, not by strength but by the power of Holy Spirit. Let us cross over every trial and suffering of this present time by the power of the Holy Spirit because our destiny is not in this world. Our crown of life is laid up above with OUR FATHER who is in heaven.